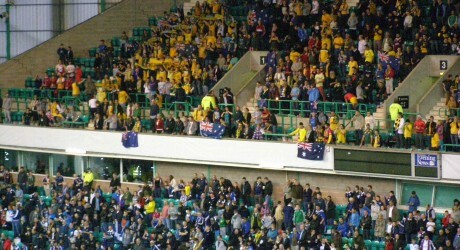 Scotland took on Australia in a pre-world cup qualifier friendly match at Edinburgh’s Easter Road last night. It was a pouring wet night even before the match started and it rained incessantly throughout. Both sides were below full strength though the Socceroos were very close to the line-up for the next series of matches against Jordan, Oman and Iraq. Scotland had young Jordan Rhodes of Huddersfield leading the attack after a stellar season in the championship in which he had knocked in 40 goals in all competitions. Gary Caldwell, formerly with Celtic and now at Wigan, captained the team and Charlie Adam of Liverpool pulled the strings in midfield. 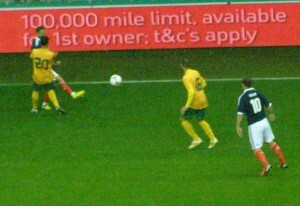 Alex Brosque, Daniel Fox, Luke Wilkshire and Charlie Adam in action in the Scotland v Australia match at Easter Road. Scotland started brightly enough and James Morrison’s shot was deflected for a corner, then Alan Hutton set up Andy Webster, but the Hearts man headed wide. Gradually the Socceroos settled and Robbie Kruse got to the bye line and cut the ball back as it was running out of play. Brett Holman’s shot seemed to be blocked by a Scottish hand on the goal line, but no penalty was given and the ball was finally put behind for a corner kick. The corner kick was only cleared as far as Marco Bresciano who struck the sweetest of volleys into the bottom right corner of the goal. It was a goal which required great technique and coolness and came in the 19th minute. Scotland keeper Alan McGregor was injured in this passage of play and replaced soon after by Matt Gilks. Another Scottish change saw Shaun Maloney take over from James Morrison. The latter move lifted the Scots and full back Daniel Fox got away down the left and his well-struck cross was headed home by Jordan Rhodes on his full international debut. As expected the second half saw a spate of changes to both teams and with Mitch Langerak replacing Schwarzer and Scott McDonald coming on for Brett Holman who was injured just before half-time. Jason Davidson took David Carney’s place in defence but the youngster was caught facing his own goal when Daniel Fox put over another excellent cross and Davidson’s attempt to clear flew past his own keeper to put Scotland ahead in the 63 minute. The goal came after a spell of Scottish pressure and the result was deserved even if the manner was cruel. Another Scottish substitute, Leeds United striker Ross McCormack, then twisted past Neill and Ognenovski before firing wide of Langerak for Scotland’s third goal. That came after 74 minutes. Ryan McGowan of Hearts came on to replace Ognenovski but the local Hibs support gave him a rough reception, as they did for Ian Black of Rangers who replaced Scotland skipper Gary Caldwell. Australia looked increasingly ragged as the game wore on. Scott McDonald went for glory when he had support inside. Archie Thompson got a few minutes at the end and won a free kick after he outstripped the defence. He also latched on to loose ball in the area and forced it past the keeper, but there was no one to finish the move. But it was a rare flourish in a second half dominated by the home team which deserved its victory.